In Am. Freedom Def. Initiative v. King County, 904 F.3d 1126, 1129 (9th Cir. 2018), the court reviews King County Metro's denial of a request to post a controversial ad on a King County Metro (hereinafter, "County" or "Metro") bus. The court followed past decisions holding that a transit advertising program is a nonpublic forum. Consequently, the higher First Amendment freedom of expression standard of strict scrutiny does not apply; instead, Metro's policies must be reasonable and viewpoint neutral. On its face, the court held that two of the three prohibited content policies by Metro were valid on its face. However, Metro's prohibited category related to demeaning or disparaging content was invalid, and Metro's application of the harmful or disruptive content category was improper. A three-judge 9th Cir. panel reviewed an appeal from the U.S. Dist. Court for the Western District of Washington. The panel affirmed in part and reversed in part. Metro accepts ads for public display unless the ads contain certain categories of prohibited content, including false statements, disparaging material, and content that may disrupt the transit system. Metro determined that Plaintiffs' ad concerning global terrorism contained all three types of prohibited content under Metro's policy: (1) False or Misleading, (2) Demeaning or Disparaging, and (3) Harmful or Disruptive to Transit System. Plaintiffs then submitted a revised, factually accurate ad, which the County rejected under the remaining two categories. False or Misleading. Any material that is or that the sponsor reasonably should have known is false, fraudulent, misleading, deceptive or would constitute a tort of defamation or invasion of privacy. The panel concluded that "[t]he falsity standard meets constitutional scrutiny, both facially and as applied." Demeaning or Disparaging. Advertising that contains material that demeans or disparages an individual, group of individuals or entity. For purposes of determining whether an advertisement contains such material, the County will determine whether a reasonably prudent person, knowledgeable of the County's ridership and using prevailing community standards, would believe that the advertisement contains material that ridicules or mocks, is abusive or hostile to, or debases the dignity or stature of any individual, group of individuals or entity. The panel concluded that the "disparagement standard discriminates, on its face, on the basis of viewpoint." Harmful or Disruptive to Transit System. Advertising that contains material that is so objectionable as to be reasonably foreseeable that it will result in harm to, disruption of or interference with the transportation system. For purposes of determining whether an advertisement contains such material, the County will determine whether a reasonably prudent person, knowledgeable of the County's ridership and using prevailing community standards, would believe that the material is so objectionable that it is reasonably foreseeable that it will result in harm to, disruption of or interference with the transportation system. The panel held that "the disruption clause, like the earlier one, survives facial scrutiny." (1) Metro permissibly rejected the factually inaccurate ad because the First Amendment does not require Metro to display patently false content in a nonpublic forum. (2) Metro's rejection of the revised ad does not withstand scrutiny. Applying Matal v. Tam, 137 S. Ct. 1744 (2017), Metro's disparagement standard discriminates, on its face, on the basis of viewpoint. (3) The disruption standard is facially valid but, on this record, Metro unreasonably applied the standard to Plaintiffs' ad. The panel disagreed with Metro that "it is reasonably foreseeable that Plaintiffs' ad will harm the transit system," because the "ads may perpetuate harmful stereotypes and may upset riders which, in turn, may cause a decrease in ridership." 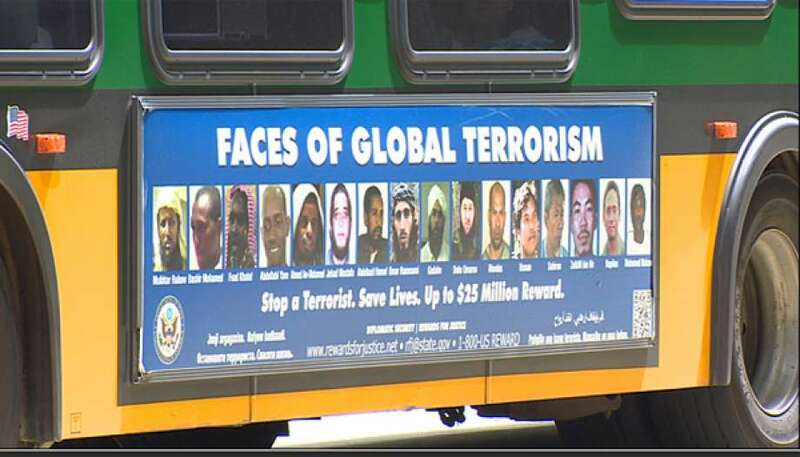 The panel based its conclusion primarily on the fact that "Metro approved a very similar ad—the State Department's own 'Faces of Global Terrorism' ad—which actually ran for a period of nearly three weeks. . . , but Metro's transit system did not experience any harm, disruption, or interference."